Grant Park’s 1893 Rosenberg Fountain with 2006 Agora in the background. Photo by Julia Bachrach. For those who love learning about the history of art and design in Chicago, 2018 will prove to be an exciting year. The Terra Foundation for American Art recently launched Art Design Chicago, “a spirited celebration of the unique and vital role Chicago plays as America’s crossroads of art and design, creativity and commerce.” Presented in partnership with the Richard H. Driehaus Foundation, Art Design Chicago is bringing 25 exhibitions and hundreds of programs to the public in 2018. As part of this initiative, I will be leading a series of Art in the Parks tours on behalf of the Chicago Parks Foundation. These tours will be fun, affordable, and open to the public. But tickets much be purchased in advance, so please register as soon as possible! Chicago's parks are the settings for a world-class collection of over 300 monuments, sculptures, murals, and more. The tradition of public artworks in Chicago parks began in the late 19th century and continues to this day. The Art in the Parks Tours, planned for May through October of 2018, will provide an in-depth exploration of park artworks throughout the city. The series will offer three bus tours that include lunch and five two-hour walking tours. You can find detailed information about each tour on my calendar as well as the Chicago Parks Foundation’s website. I’d like to share a few highlights here. Bus tour visit to Fountain of Time in Washington Park. Photo by Elizabeth Cummings. 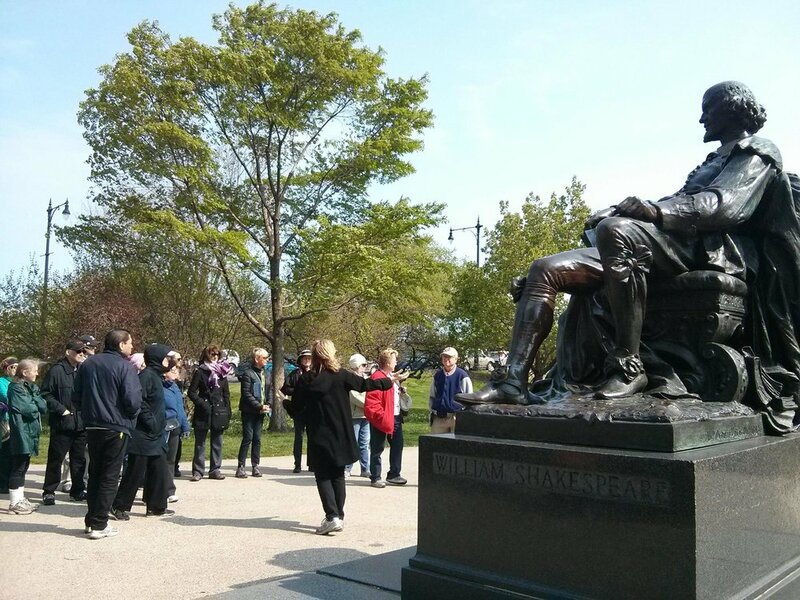 Two of the walking tours will feature Lincoln Park, one of Chicago’s oldest parks and site of some of the city’s earliest public artworks. Among its most iconic early outdoor monuments, Abraham Lincoln: The Man honors the park’s namesake. Renowned 19th-century artist Augustus Saint-Gaudens (1848–1907) created the 1887 sculpture, popularly known as the Standing Lincoln. In producing this powerful portrayal of Abraham Lincoln, Saint-Gaudens relied upon a newly-discovered life mask of the beloved 16th president. Eli Bates (1806–1881), a wealthy Chicago businessman, had bequeathed the funds for Lincoln: The Man, as well as for Storks at Play, a whimsical sculptural fountain near the Lincoln Park Conservatory. Abraham Lincoln: The Man. Photo courtesy of Chicago Park District. The Alarm in Lincoln Park. Photo by Julia Bachrach. Other early sculptural donations to Lincoln Park seem somewhat more unexpected today than Bates’ gifts. For instance, Martin A. Ryerson (1818–1887) commissioned the Alarm as a tribute to Native Americans of the Ottawa Nation. As a young man, Ryerson had traded furs with members of the Ottawa tribe, and later he made a fortune in lumber and real estate. Ryerson commissioned artist John J. Boyle, who had spent time observing Native Americans in North Dakota. The bronze sculptural group, which depicts an Ottawa family in a dignified manner, was installed in 1884, long after Native Americans had been forced out of Chicago. In addition to monumental art, the Art in the Parks series will examine the history of landscape design in Chicago’s parks. Humboldt Park was a special place for Jens Jensen (1860 – 1951), a Danish immigrant who began as a street sweeper and went on to become Dean of Prairie Style Landscape Architecture. Jensen and his family lived in a Greystone two-flat across the street from the park in 1905, when he rose to the position of General Superintendent and Chief Designer for the entire West Park System. This was an important period of experimentation for the landscape artist, and redesigns in Humboldt Park allowed him to explore new ideas. The walking tour of Humboldt Park, schedule for July, will include a stroll along Jensen’s iconic Prairie River and a visit to his circular Formal Garden, a space historically used to showcase outdoor artworks. Left: Jens Jensen’s Humboldt Park Prairie River, 1941. Chicago Park District Records: Photographs, Special Collections, Chicago Public Library. Right: Humboldt Park Prairie River, 2013. Photo by James Iska. Unconditional Love near DuSable Museum in Washington Park. Photo by Julia Bachrach. Two additional walking tours will also weave together the history of landscape design and significant artworks. One will explore Washington Park, laid out by the “Father of Landscape Architecture,” Frederick Law Olmsted, in 1871, and home to the DuSable Museum of African American History. The other tour will sojourn to Grant Park, a site with majestic elm trees, formal “outdoor rooms,” and one of the city’s most important collections of outdoor sculpture. Each of the bus tours within the series will focus on a specific theme. The May 19th bus tour celebrates important milestones in the history of the city, state, and nation. When the World’s Columbian Exposition opened in Jackson Park on May 1, 1893, Daniel Chester French’s famous gilded plaster Statue of the Republic served as the symbol of the fair. Statue of the Republic in Jackson Park, 1956. Chicago Park District Records: Photographs, Special Collections, Chicago Public Library. A permanent gilded bronze version of the monument was installed to commemorate the fair’s 25th anniversary. Dedicated on May 9, 1918, the “Golden Lady” pays tribute to the fair and the centennial of Illinois Statehood. Our tour, taking us to Jackson Park just over a hundred years later, will highlight the Statue of the Republic, as well as Skylanding, Yoko Ono’s recent artwork that marks the site of the fair’s Japanese Pavilion. This tour will also include a stop at the 1918 Centennial Monument in Logan Square, a 68-foot-tall column with sculptures created by Evelyn Beatrice Longman (1874-1954), one of Chicago’s most successful early 20th century woman artists. The June 23rd bus tour features old and new parks as well as historic and contemporary artworks. This tour will visit two monuments to John Peter Altgeld (1847-1902), the Illinois governor whose political career ended when he pardoned several men who had been unfairly convicted in the 1883 Haymarket Affair. Gutzon Borglum (1867–1941) of Mount Rushmore fame created Lincoln Park’s 1915 Altgeld Monument. In this bronze sculptural group Altgeld is depicted as a reformer protecting a family in need. Richard Hunt (b. 1935), one of Chicago’s most acclaimed contemporary sculptors, produced a second local monument to Altgeld in 1989. Located in Jonquil Park, this artwork, entitled Eagle Columns, was inspired by “The Eagle That is Forgotten,” a 1913 poem that made many Chicagoans recognize Altgeld as a hero who deserved recognition for making the controversial decision to exonerate the Haymarket martyrs. Left: Altgeld Monument in Lincoln Park. Photo by Julia Bachrach. Right: Eagle Columns, monument to John Peter Altgeld in Jonquil Park. Photo by Julia Bachrach. The last event, an October 20th bus tour called Murals and More, will highlight some of the magnificent murals located in Chicago park field houses. These include works such as Hamilton Park’s Historical Series by John Warner Norton (1876- 1934), a nationally-recognized instructor of mural painting at the School of the Art Institute of Chicago. A visit to Sherman Park will reveal a series of murals produced by eight of Norton’s art students in 1912. Historical Series murals in Hamilton Park Field House. Photo by James Iska. I hope you’ll attend some of the tours. Don’t put off registering for too long, because we expect them to fill up fast! To learn more about all of the other exciting programs, events, and exhibits occurring this year, check out the Art Design Chicago website at artdesignchicago.org/about.